1. Evaporation – Heat, normally from the sun, can turn water from a liquid into a gas called water vapor. Evaporation can happen from any water in the world, especially from standing bodies of water like lakes and oceans. Heat energy goes into the water molecules to change them into vapor, which causes cooling at the surface they evaporate from. Evaporation can even happen from the surface of human skin! 2. 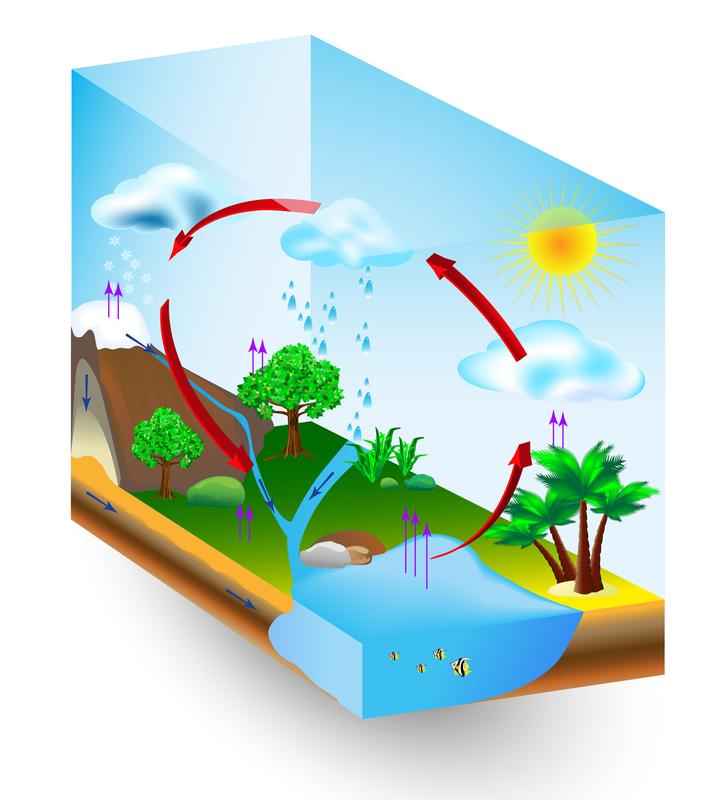 Transpiration – Plants and animals “breathe” out water vapor, which then goes back into the air. This is called transpiration. Plants pull water out of the ground and release it as vapor through their leaves. 3. Condensation – Water vapor mixes with air. When hot, moist air rises, it begins to cool and reaches a dew point temperature, where there is not enough energy anymore to keep the water in gas form. Some of the moisture condenses back into liquid water droplets that float in the sky and form clouds. 4. Precipitation – When enough water droplets are floating in the air as a cloud, they start to collide and join together. This makes them join together into bigger drops that can be heavy enough to fall back down to the ground as rain or, if the air is cold enough, as snow. 5. Accumulation/Storage – Liquid water can accumulate, or build up, in lakes and oceans, and also in underground lakes called reservoirs. 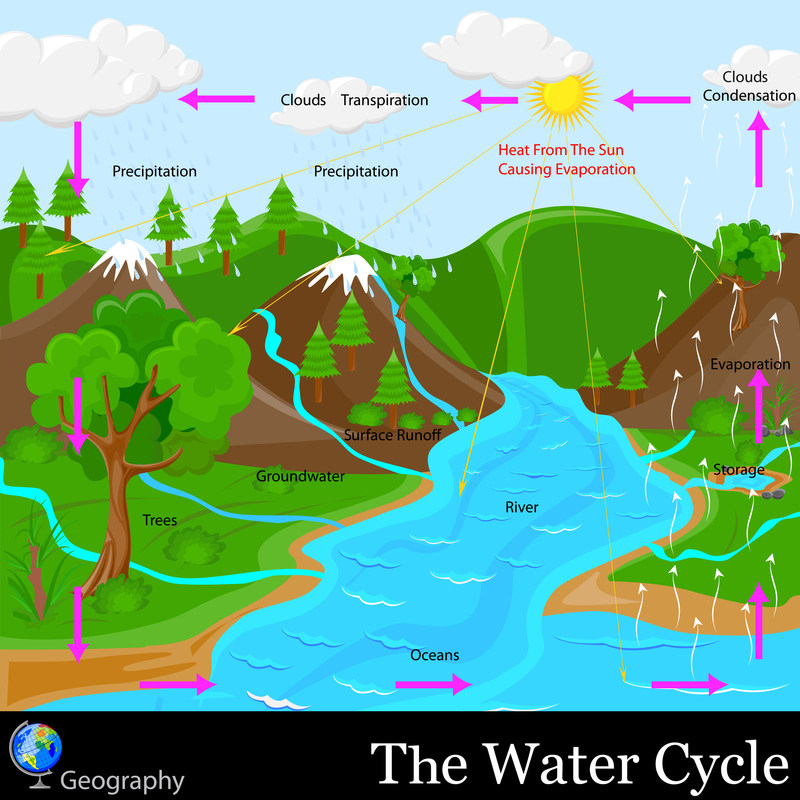 Some water stays underground for thousands of years, while water in lakes and oceans evaporates to go through the cycle again. Check out our interesting facts about water!